In my ongoing efforts to learn Spanish, I'm highlighting a Spanish word each day during April as part of the Blogging from A to Z Challenge. I'm also sharing the random thoughts that pop into my head when I try to pronounce them. Today is the first Wednesday of the month, which means it's IWSG day. 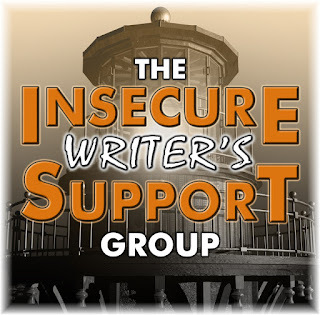 The Insecure Writer's Support Group (IWSG) is a place to share and encourage, where writers can express their doubts and concerns without appearing foolish or weak. It's a great place to mingle with like minded people each month. 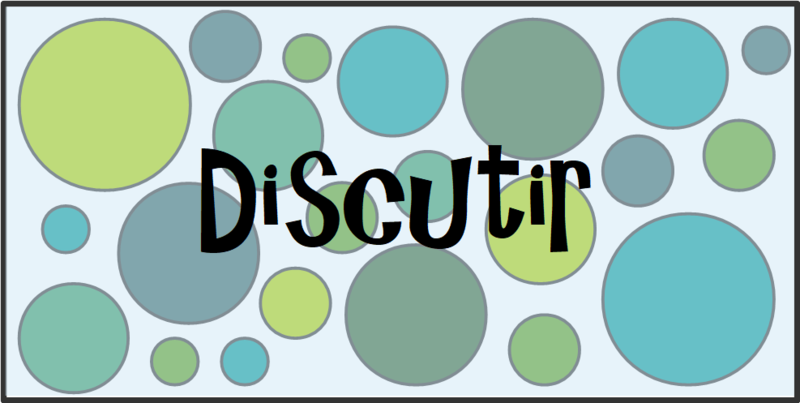 I chose today's Spanish word, >>discutir<< (to discuss), as a lot of interesting discussion happens in the comments on people's posts. "When your writing life is a bit cloudy or filled with rain, what do you do to dig down and keep writing?" Check out how people have answered this month's question, as well as the other insecurities and writing topics they may have shared by visiting the IWSG sign-up list here. Apologies in advance to all of you Simon the Time Traveling Cat fans, but he's not making an appearance today to answer this month's question. He's way too busy napping and dreaming about catching lizards to be bothered with this blogging nonsense. Which is a good thing, because I've got other stuff to share with you that's far more interesting than my usual complaints about Simon's hairballs and constant demands for full-fat milk. So here's the big news - I set a release date for >>Murder at the Marina<<. The big event will take place on Thursday, June 21st, which just happens to be the start of summer in the Northern Hemisphere (apologies to all of you Down Under) and National Seashell Day. 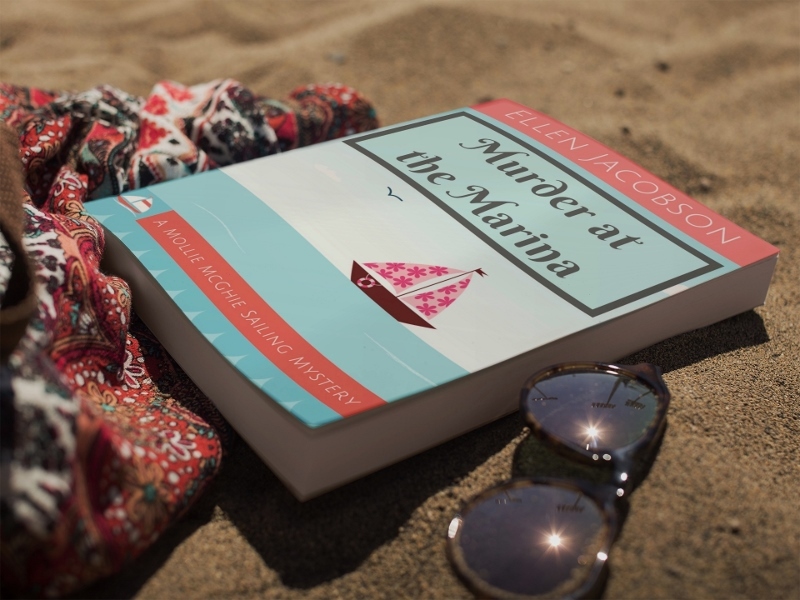 What better way to celebrate than by reading a cozy mystery that features sailing and walks on the beach? A cat also plays a starring role, but don't tell Simon. 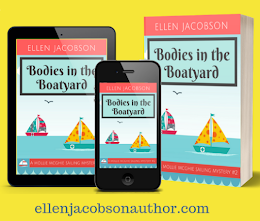 I picked a June release date because it should give me enough time to get the next book in the series, >>Bodies in the Boatyard<<, in reasonable enough shape so that I don't have too much of lag time between releases. Thanks to everyone for their advice on release schedules on last month's IWSG post and in the IWSG Facebook group. Which brings me to the next thing that I want to share with you - my writing insecurity. Yep, you guessed it, the thought of publishing a book is kind of freaking me out. Whenever I try to talk with Simon about it, he just yawns, rolls over on his back, and then demands that I scratch his belly. He's like my own personal Insecure Writer's Non-Support Group. Anyhoo, enough about Simon. I'm making plans for my book release, including seeking out folks who want to help with a blog tour between June 17th and June 30th and/or are interested in reviewing the book and would like an ARC (advance readers copy) eBook. If this sounds like it might be up your alley, please fill out this handy-dandy form on Google Docs or drop me an email at ellenjacobsonauthor (at) gmail (dot) com. UPDATE: I've had a phenomenal response from people offering to help with the book release. I'm blown away by how supportive everyone has been. Thank you! I've now closed the form for responses, but left it available as read-only in case anyone is thinking of setting up their own form and wants to see what mine looks like as an example. You can find out more about >>Murder at the Marina<< on my author blog. When your life is a bit cloudy or filled with rain, what do you do to keep your spirits up and stay focused? What's your favorite word that starts with "D"? Any book release tips? 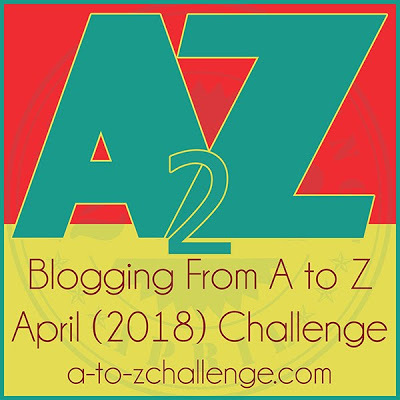 Check out the other folks participating in this year's Blogging from A to Z Challenge here. Thanks, Ronel! It would be great to have you do a post in July. I'll touch base with you on it. Thanks, Erika - that would be great! I'll email you with the details. Congrats on the new release! Love the titles of your books! I'll be traveling during your release and tour dates, but you're welcome to be my guest in early June or after the 4th of July! Looking forward to reading it and to "discussing" it on my blog. Happy IWSG Day! That would be awesome, JQ! Sometime in July would be perfect. I'll email you with details. So I'm only online once a month right now, which doesn't correspond with your release tour, but you are totally welcome to grab a Writerly Wednesday feature on my site. (First Wednesday of the month.) My roster is surprisingly empty right now, but I suppose that's because I'm not trying to keep it full... Anyhow, you've got my email. Thanks, Crystal! A Writerly Wednesday post sound great. I'll shoot you an email. That's so exciting you set a release date! I'd be happy to help out. I think you have a good handle on your release. You're planning early. :) My cat is napping in the sun himself while I'm busy visiting blogs for IWSG day. I'm having fun learning new words. Congratulations! And thank you for the kind word on my snippet. Happy Writing! That's good timing for your release. Have you got everything in place for formatting and stuff? I think (think being the operative word) that I'm all set for formatting. I did a test run on Draft2Digital for the eBook version and it was really easy and came out nicely. I've downloaded a template for the print version and, while it's fiddly, it seems to be going okay. Fingers crossed that I didn't speak too soon. That's the perfect way to describe it - not being able to backspace. There is so much work that goes into it. I knew that going in, but my To Do List still astounds me. You'll be fluent by Z! Zapata? Good luck on that release. I never find there's enough time to prepare even if that "due" date is a year out. I'm terrible at that. Ergo...publisher, please do it for me. Fluent by Z - I wish :-) I'm trying to start early enough so that I can get it all done, but I'm not sure you can ever start early enough. I have a feeling Simon will come back with a vengeance. Congratulations on your upcoming release! Keep plugging away at it. That's the way to try and make it a success. Good advice, J.L. I keep plugging away and try to keep at the To Do List. Thanks so much, Susan! I'll shoot you an email. Thanks so much for offering to help with Tweets - that would be fantastic! Congrats on the upcoming release! You've reminded me that I 'sorta' speak Spanish and I wanted to get better at it so I was using Duolingo--but then I started slacking, and then stopped. Time to get back to it! I've been using Duolingo too. It's a lot of fun. Almost like playing a game. You have a new book. Awesome. When it's gloomy I love to read. I've a pile of books at all times. Murder mysteries are my favorite reads. Disfrutir, which I think means, "enjoy" is my favorite Spanish D word. Congrats on the release and best of luck with your new book! I've heard that it's good to have multiple books ready to go when you're ready to publish, so that readers can jump right into your next book. Unfortunately, I'm such a slow writer that if I waited until then, I might not live long enough to see them published. That's the advice I've read as well. Hopefully, I can get the next one out in a reasonable timeframe. I'm more than willing to write a review. In fact, I would LOVE to do that. I'll email you. Thank you so much, Ryan!! Thank you for stopping by my blog. Glad to see you're trying to learn another language. Congrats on your release date! Thanks, Toi! It's exciting and scary. I think you are doing great with planning and scheduling for your release--way better than I ever do! I've signed on for the release tour. Thanks so much, Rebecca. When I started making up a list of everything I needed to do for the release, I realized that I needed a bit of time to get it all organized. Congrats on the book release! I love mysteries, and your series looks delightful! Simon will have to be content with tummy rubs instead of the spotlight for the time being. Congrats on the book release! I get the fear, but trust me, you've created a great book and readers will love it. You're so sweet, Tyrean. :-) I'm getting more and more nervous about putting it out there for people to read, so your encouraging words mean a lot. Ellen, this is wonderful news! Congratulations on the book release AND continuing a series. That's wonderful! I'm excited for you :D If I can help to get the word out via blog/Instagram I'd be more than happy to! Clicking over to the GoogleDocs now! Exciting - a book release. When I'm gloomy I get out my puppets in crime!!! Congratulations on completing your book and getting it to this stage! Congrats on your upcoming book release. I need to take lessons. As for the letter D - I love to call my heroes by names starting with D. The heroine of my urban fantasy short story collection is called Darya. The hero of my high fantasy novel is called Darin. I have to fight with myself to have a variety in names when I write, or all my lead characters would have names starting with D.
¡Hola, Ellen! Estoy sin practicar con la lengua, pero me gusta discutir escribiendo en IWSG. Is this your debut novel? SQUEE! I'd be happy to spread the word on my blog. ¡Felicidades! It is my debut. Wow, that feels weird saying that. Thanks so much for the offer to help - I'll touch base. Honestly, I can't believe I'm at this point and I wouldn't be if it wasn't for people like you who have been so supportive from start to finish. "Chapeau" veut dire "sombrero" en Espanol. Ca c'est francais au dessus :-) Je ne sais pas comment on dire ca en espanol. I am SO sorry I have been out of the loop.... but I am SO EXCITED to hear about your new book release! I plan to fill out the google docs form, but just wanted you to know that I'd be happy to help with the blog tour in any way I can. YIPPEE... I can hardly wait to read this wonderful mystery!! Congrats on your new book release. Very exciting! Thanks so much, Lynda. I appreciate you taking the time to visit my blog considering all that's going on in your life just now. Big congrats on your cozy murder mystery release! Good luck with the A to Z challenge. Congrats on having a release date! With a second book coming out, it sounds like you can keep yourself busy to hold the nerves down at least a little bit. Good luck! Congratulations on the impending release, Ellen - and great move getting the second book almost ready for release. That's one of my excuses for holding off releasing my mystery. Reading a sailing mystery at the moment - by Kristina Stanley - so look forward to yours. Bravo, Ellen! I am always in awe of you all who publish books and begin marketing plans. All the luck with your new release. You are definitely not letting the sand slow you down. I love cozies! Again, congratulations! Thanks, Victoria - it feels so crazy to be talking about marketing plans. I'm so excited about your book. 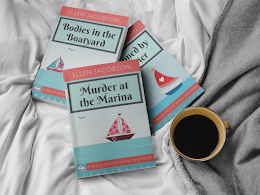 I love cozy mysteries and can't wait to read Murder at the Marina. Congrats on setting a release date! That's awesome. Can't wait to read it.